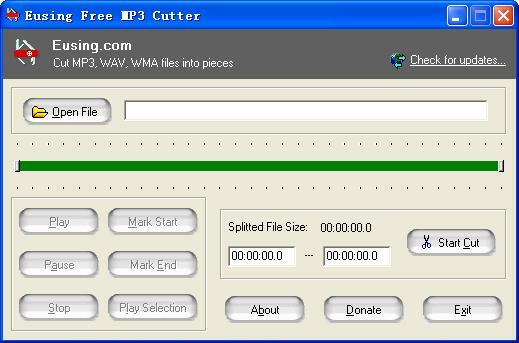 Eusing Free MP3 Cutter is a simple utility that allows you to cut out pieces of an audio file (MP3, WAV, WMA). In a few clicks, you can select a part of a song and save the selection in a separate audio file. The software works very fast and has a user-friendly interface. 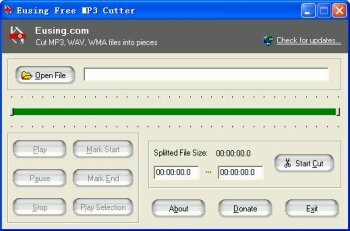 There is a small player built in Eusing Free MP3 Cutter and so you set start-time and end-time just when you listening the song. It also provides a slider bar to visually position a cut points where you want to cut.